Captain Troy Deeney was the only Watford player named in the Professional Footballers' Association Championship Team of the Year. 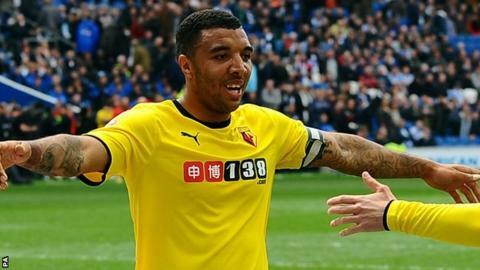 Deeney, 26, scored his 21st goal of the season on Saturday as the Hornets were promoted to the Premier League. He is joined in the team - voted for by players - by Ipswich striker Daryl Murphy, who has scored 25 times. Bournemouth, Middlesbrough, Brentford, Wolves, Norwich, Derby and Sheffield Wednesday are also represented. Bournemouth can join Watford in the top flight next season if they win either of their remaining two games, starting against Bolton on Monday night. Winger Matt Ritchie - who has scored 12 goals this season - and right-back Simon Francis are in the side from the Cherries. Wolves playmaker Bakary Sako was voted in, and Brentford's Alex Pritchard - on loan from Tottenham - and Boro captain Grant Leadbitter complete the midfield. At the back Boro left-back George Friend was joined by Norwich skipper Russell Martin and Derby's Richard Keogh, while Keiren Westwood of Sheffield Wednesday was voted in as the best goalkeeper. See who was named in the PFA Premier League Team of the Year here.